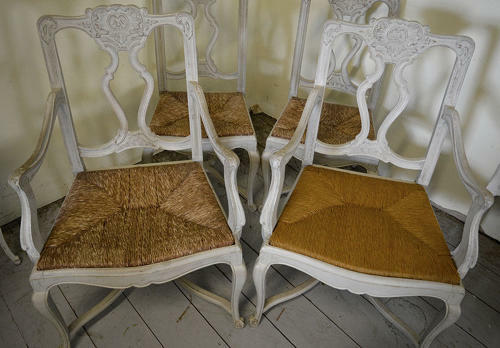 Set of six painted oak Louis XIV/XV style transition chairs from Flanders. Flemish chairs are unusually generous and comfortable relative to French counterparts with typical fine, low profile carving particular to the region. The off-white paint is as found and had age when the set bagged for a holiday home over a decade ago. One of the carvers has been re-rushed. A sturdy, well proportioned handsome set of chairs.